In the conclusion to his sermon, Stephen claims the current generation is just as stiff-necked and rebellious as the Wilderness generation, and will therefore fall under the same judgment (7:51-53). The conclusion to Stephen’s sermon draws on themes found throughout the Hebrew Bible. First, resistance to the apostolic message represents resisting the Holy Spirit. The people are called stiff-necked. The word appears only here in the New Testament and it appears 8 times in the LXX, usually in the context of covenant unfaithfulness (Ex 33:3, 34:9 and Deut 9:6). To be “stiff-necked” means to “be stubborn, obstinate, or rigid” (HALOT). Second, they are also described as having “uncircumcised hearts.” This phrase is also associated with covenant unfaithfulness (Jer 9:25, Lev 26:41, Jer 6:10, Ezek 44:7, 9). Third, the people are resisting the Holy Spirit. “Resistance” is a rare word in both the New Testament and the LXX, appearing only here and Num 27:14, where it describes the rebellion of the people in the Wilderness of Zin. The present generation has not accepted the word of God as it has been revealed to them. Stephen therefore claims the leadership of Israel has the Law but they refuse to obey it. Is it true that Israel has not obeyed the Law? One might argue that they have kept most of it since they do the sacrifices correctly and practice the Works of the Law which sets them apart as Jews (Sabbath, circumcision, etc.) But as the prophets, John the Baptist, and Jesus have all pointed out, the external doing of the Law means nothing if there is not a change of heart – sacrifice without obedience with worthless. Stephen accuses the present generation of the same hard-headed resistance to the word of God which was demonstrated by the worst of Israel’s kings. Persecuting and killing the prophets who predicted the coming of the Righteous One. Those who persecuted the prophets would include Ahab and Jezebel in the northern kingdom, Manasseh in the south (who was reputed to have killed Isaiah and any other true prophet who challenged him), but also the temple authorities who persecuted Jeremiah. Jeremiah spoke against the Temple and was nearly killed, Jesus also challenged the Temple and was killed. The most stinging part of this critique is that these prophets predicted the coming of the messiah and were silenced by the appointed authorities of the nation. Most likely the Sanhedrin would have agreed with Stephen on this point, the prior generations were corrupt – but not so the current administration. This generation has done the same to the Righteous One himself! At this point Stephen joins the Apostles instating that the execution of Jesus was in fact killing the Messiah. That Stephen refers to Jesus as the Righteous One he is emphasizing the fact that he has suffered and died innocently, at the hands of the men assembled to hear this speech! Little wonder they react with such fury. Finally, Stephen accuses the Sanhedrin (and that entire generation) receiving the Law, but not keeping the Law. They had the Law and the Prophets which testified to the coming of Jesus, yet when he came he was not accepted, but rather he was executed as a criminal. The speech is therefore not critical of the Law or the Temple; it is a stinging condemnation of the people who had received the Law in the first place. Stephen’s sermon is the exact message that every church needs to hear. In all reality, sinners are the ones that put Jesus to death because we all are sinful and in need of a savior. It can be very shocking and some may want to deny it, but Christ needed to die in order to save the ones that He loved. God planned from the beginning of time (Genesis 3:15) that there would be a Savior to save His people. It is interesting that Stephen used so many bible passages from the old testament to depict the message of salvation. My pastor preached a sermon today on Hebrews 4, and He said that this was a book that was used to preach to the Jews. Hebrews 4 talks about the rest that we can have through Jesus Christ because we believe in Him. Stephen was very passionate about the love that He had for God, and He wanted to share the rest that He has in Him with others around Him. It is a joy and a comfort to belong to Jesus, and it is a great reason to share the good news with others. Anna, good job on your discussion post this week. I noted that you thought it was interesting how many times Stephen used Old Testament Bible passages to tell the story of salvation. This is true, Stephen used several different passages such as Acts 7:42-43 and 7:49-50. However, I think there was a strategic reasoning behind why Stephen did this. Going back to the first short paper we had to write last week, I found that when the early Christians followers were living out their new faith they were also living out their past Jewish heritage as well. Why would their past Jewish heritage make Stephen want to include Old Testament Bible passages you ask? This is because Jewish heritage included the use/belief in the prophets prophecies. This is seen throughout the book of Acts such as when Peter quoted Joel in Acts 2:17-21 or King David in Acts 2:25-28; 34-35. Therefore, the point I am trying to make here is that I think Stephen knew believers were more likely to accept/believe in the story of salvation when it involved their ancestors, history, and fulfillment of prophecies. Also, I liked how you mentioned the great passion and love Stephen had for God. If you take a step back and think about it Stephen had some of the most tremendous faith in the Bible because he was willing to lay down his life for it (Acts 7:60). What an amazing type of faith to have right? It’s interesting to see these comparisons between Jews in the Old and New Testaments. Throughout much of the Old Testament it seems we only see all of the (countless) times that Israel messed up and God punished them, then took them back. Much of this consisted of idol worship. It happens over and over again in that order, so it really looks as if Israel was not a nation that really kept the law. However, in the New Testament, the problem we see with the Jews is actually that they keep the law almost too harshly. There seems to be a lot less idol worship and straying from their covenant with the Lord, but just a lot of self-righteousness and going through the motions. Maybe this doesn’t really depict so much of a change in the behavior of the nation of Israel or merely a change of focus on the personnel, from the unrighteous to the religious leaders. Either way, this contrast between Old and New Testament Israel is something I had never really thought of before. Stephen appears to be teaching whole hearted truth in this passage, but a truth that was not easy to swallow. The themes from the post above were indubitably aimed to resonate with the audience, to pierce directly through their comfort zone. I certainly agree that the resistance and rigidity of following the law does appear to show a routine, not a change of heart – and this was exactly what Stephen was driving towards. What I truly find interesting in this passage is that Stephen probably knew exactly how far to go before the people would be angry. But instead of caring for his own life, he boldly (almost cantankerously) targets the Jewish political and spiritual leaders – reminding them of what they have done. Whether or not they actually believed what he said, this certainly upsets them enough to stone Stephen. God certainly had a plan in this, impacting Saul/Paul to follow God’s plan, and to impact many others who may then have questioned why he was put to death, and the claims that he made. The other detail that was pointed out in our course notes about Messiah standing in judgment against the Jewish leadership was really a new perspective for me. At that moment, I am certain that all the pieces fit, that the false accusations were similar to Jesus’ accusations were an indication of Stephen’s worthiness to be a follower of Christ, and that Stephen was brought into the presence of the Lord at that very moment. Stephen is very bold for calling out the Jewish political and spiritual leaders and reminding them of what they had done to the one and only Messiah. This message seemed to have stuck a guilty conscience in them because they were so furious for the way he spoke out against them that they stoned him. I believe that there should be Stephen’s in the church today because there are many people who call themselves Christians but their hearts may not be truly set on winning souls for Christ. I’m sure that people today do not like to be told that they are doing something wrong but it needs to be done. Stephen was very bold for standing up for what he believed in even though it probably would cost him his life. The Second Commandment to Love People, which includes a number of things, including “winning souls for Christ” as you might put it. Have you noticed this “Evangelical” tendency too, or is it just me? In Acts 7:51 Stephen calls the people stiff-necked people who are just like there ancestors who are constantly resisting God and the Holy Spirit. He parallels them with the time when they wandered in the wilderness with harden hearts because they would not follow and listen to God. I love how in Stephens speech he brings back the huge experiences that the Jews had gone through with Egypt and wandering in the wilderness. He calls the people to not make the same mistake as their ancestors made. This speech technique is very good because he is appealing to something that goes close to home for the people they had been taught since they were young and they all knew it clearly. The people do not listen and they gnash at their teeth and are furious with the words of Stephen because he accuses them of killing the Messiah. Stephen exclaims that they are just like their ancestors who resist the Holy Spirit. Thinking about this situation today we can parallel it with knowing the right thing to do and yet be do the opposite. We reject instruction in our lives and choose to live for our own passions and desires. 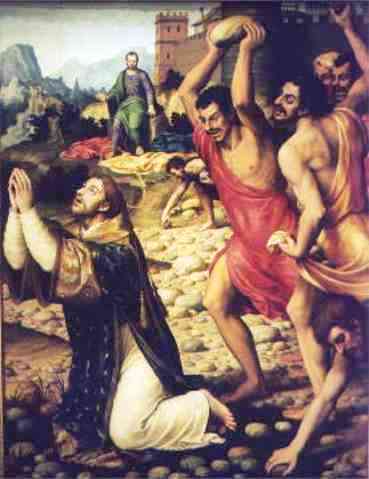 This experience of the stoning of Stephen is very important to go back and read and to check our hearts to make sure we are not making the same stupid errors as the people who killed him. Stiff-necked individuals are people who just keep doing what their past families would do. They follow in their footsteps. Not accepting who God is and what His truth says. Instead they stay hard hearted and they resist knowing God and disclaim His truth. The people are stubborn in their own ways and the fall to worldly desires rather than spiritual desires. They are unfaithful to all people, unfaithful to themselves and they are unfaithful to God. Even though they have heard the word of God and they have heard of His glory, they turn their heads to His truth. “Sacrifice without obedience is nothing” when we sacrifice our lives to Christ and when we give our all to Him and we do nothing with it we end up being nothing. Constantly people have become hardened and have pushed God away. They have rejected who he is. When we understand the value of Christ and the life changing commitment it brings, our hearts will never go back to their old ways. As people with soft hearts we need to encourage the hard heart individuals. Stephen proclaims this issue and shares that person of their disobedience to God, innocent lives will be taken away. I agree, stiff necked people are people who just keep doing what tradition tells them. They are judgmental at any form of change, and they are stubborn into changing. I think the Sanhedrin wanted to keep to their tradition because many times, reputation is what people hold to. When someone breaks tradition, many rebuke it. I think the Sanhedrin and those unaccepting of the Messiah was stubborn and not looking into what was prophesied in the past times. I think as a result of sin, it is just natural to turn the other way to something new because we like things to stay the same. In Stephen’s speech, he does a good job pointing out that they are being stubborn and unaccepting. Stephen doesn’t just say it, but proves it with men that God used and showed what had been prophesied. Though the actual word “resistant” is only used a few times in scripture I would say its a good description of the Biblical Jewish people. Whether it’s refusing to take the promised land, rebelling against God in the judge cycle or the religious/political Jewish elites maintaining their wealth and power out of selfish ambition instead of them being servants to the less fortunate. All through scripture, there is rebellion, refusal, and resistance to God’s plan. I would say that it only makes sense, unfortunately, that the Jews of the time would still be doing things like keeping the law but ignoring the heart change. When Stephen confronts them with the fact that they were not even following the law correctly (7:53), a response of anger is not necessarily uncharacteristic. The one thing that they clung to with all of their strength they did not even do right. Mostly because of the tightness of their grip. Through clinging to the practice of the Law they lost the meaning, and I think that is partly what Stephen’s speech is about. He desires them to move away from that kind of behavior. I do not think it is surprising the way people responded, and I think it is so interesting to think that if Stephen said this in one of our churches today, what would happen. Becoming a Christian does not make everything simple and easy, so for these people to hear what he had to say, it makes sense why they were so upset. I think we can use this as a reminder, of how we respond to any correction in our own life. I think we can learn from what Stephen preached and how his audience reacted, and hopefully adjust our ideas to better fit the ways of the Gospel, and what God would hope for us. I think you made a really good observation that if Stephen was in one of our churches today and said the things that he did, we would not know what would happen. It’s crazy to think about the response that the church would have to the words of Stephen. So often people from outside of the Christian faith think that Christians have it all together and are perfect people, when in fact they need correction in their lives just as much as those who are not believers. Even though the consequences of Stephen were not good, we are able to learn from his boldness and to shape our faith with that sort of boldness. In Acts 7, Stephen is being bold. At this point, I imagine him frustrated and at the point where he cannot keep quiet any longer. He is addressing the Sanhedrin, as a defense to the council. His speech goes through the time of Abraham, Joseph, Moses and Israel’s abandonment of faith. Change of heart or follow the law. This is what Stephen focused on in his defense, the idea that you can have the knowledge of the Law, uphold the majority of the Law. At the same time, your heart is not changed, you do things with the wrong truth, wrong motivation or reasoning. It happened back in the life of Abraham, Moses, Joseph, Israel, and Stephen evens goes further to say it is the people today as well (Pohill, 2093). He accused many at this point, but the council themselves were okay, because the prior generations were corrupt, but not the current administration. Then, He went a step further, Stephen then brought up the persecution of Christ, and killing the Messiah. He presents the truth that Jesus was innocent and died, because of them. By the end, those in the room probably had smoke coming out of their ears. Stephen said what no one else did, his boldness and honesty got him in trouble. He stated that they received the law, but they did not keep it. They would not accept the coming of the Messiah and then choose to execute him (Long). Although Stephen was showing them the truth, they again denied it and stoned him to death Stephen for his boldness and defense. I think the biggest thing the Jewish leaders were missing was the authenticity behind their faith. Long said “sacrifice without obedience with worthless”. This compares interestingly to James 2:17 which claims that faith without words is dead.In order for our faith to be prevalent it needs to be accompanied by genuine actions that speak to our heart. Genuine and authentic actions and relationships are the foundation of Christianity. 1 Corinthians 16:14 gives us the courage to do everything out of love. Jipp reflects on Peter’s response at Pentecost to the treatment of the Righteous One by drawing in a theme of condemnation and the opportunity for repentance from the Nation of Israel (48). It is interesting how “stiff-necked people” are almost described as a hereditary trait. Since oral tradition was common in Ancient Biblical times this would make sense if all the generations heard the same thing their ancestors done and just naturally acted on in without considering their own religious experiences. 2 Timothy 1 also talks about a spiritual trait that flows generation to generation but this one has a positive spin and the characters are being commemorated for their faith. There seems to be a distinct difference from the attitudes of the early church and believers compared to the Jewish religious leaders. I think that Stephen hit the officials right in their sweet spot. Stephen attacked their own self worth not the law like you stated. Comparing them to the Old Testament people who killed the prophets back then announcing the coming of the Messiah. Stephen comparing the officials to Jezebel is kind of telling them that they are lower then scum and don’t listen to God at all, and in not listening to him and killing the messiah they rejected God just like the people in the wilderness. I would also go to say that even though Stephen is trying to get the people to understand all they do is gnash their teeth and cover their ears and yell. I think that this shows how stiff necked and stubborn these people are. I also think it shows how prideful the officials have become in their position and law. They are so proud of who they are and how they have “kept” the laws that it had blinded them to the reality of Jesus Christ. Their own thoughts of who the Messiah was supposed to be also blinded the people. They may have been following the law to the best of their ability but they didn’t have the faith written on their hearts. Their hearts had become hardened to the thought of Jesus Christ. True God used this as a stepping stone for the Gentiles to receive the Holy Spirit. But the officials were so caught up in their own pride that they put a man to death.